Metadata in a data warehouse is similar to the data dictionary in the context of a database. It stores data about data in the data warehouse. Extraction and Transformation Metadata: Extraction and transformation metadata contain data about the extraction of data from the source systems, namely, the extraction frequencies, extraction methods, and business rules for the data extraction. Also, this category of metadata contains information about all the data transformations that take place in the data staging area. End-User Metadata. 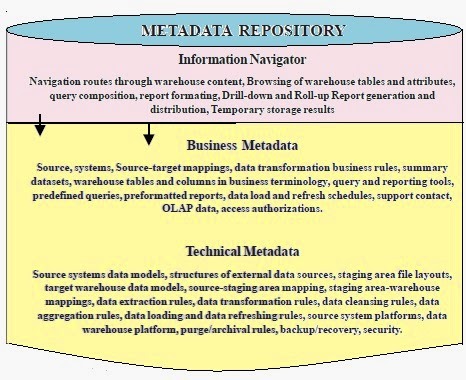 The end-user metadata is the navigational map of the data warehouse. It enables the end-users to find information from the data warehouse. The end-user metadata allows the end-users to use their own business terminology and look for information in those ways in which they normally think of the business. Why is metadata especially important in a data warehouse? 1. First, it acts as the glue that connects all parts of the data warehouse. 2. Next, it provides information about the contents and structure to the developers. 3. Finally, it opens the door to the end-users and makes the contents recognizable in their own terms. · What tables, attributes, and keys does the data warehouse contain? · From where did each set of data come? · What transformation logic was applied in loading the data? · How has the data changed over time? · What aliases exist, and how are they related to each other? · How often does the data get reloaded? List of Predefined Queries and Reports, Business views. Authorization Requests, Information Retrieval into Desktop Applications such as Spreadsheets. Whenever historical information is analyzed, meticulous update records have to be kept. The metadata history is a good place to start any time-based report, because the analyst has to know when the rules changed in order to apply the right rules to the right data. If, for example, sales territories were remapped in 2001, results from before that date may not be directly comparable with more recent results. · Aliases can make the warehouses much more use-friendly by allowing a table to be queried by “Widgets produced by each factory” rather than “MFSTATS.” Aliases also come in useful when different departments want to use their own names to refer to the same underlying data. Obviously, though, aliases can also cause a great deal of confusion if they are not carefully tracked. · Volumetric information lets users know how much data they are dealing with, so that they can have some idea how much their queries will cost in terms of time and computational resources. Volumetrics could usefully include such information as number of rows, growth rate, usage characteristics, indexing, and byte specifications. · It is also useful to publish the criteria and time scales for purging old data. As discussed above, a typical data warehouse contains lightly and heavily summarized data, and aggregations as well as full detailed records. The algorithms for summarizing (and aggregating) the detail data are obviously of interest to anyone who takes responsibility for interpreting the meaning of the summaries. This metadata can also save time by making it easier to decide which level of summarization is most appropriate for a given purpose. Data warehouses implement relationships in a different way form production databases. Metadata pertaining to related tables, constraints, and cardinality are maintained, together with text descriptions and ownership records. This information and the history of changes to it can be useful to analysts. Operational databases are often owned by particular departments or business groups. In an enterprise data warehouse, however, all data is stored in a common format and accessible to all. This makes it necessary to identify the originator of each set of data, so that inquiries and corrections can be made by the proper group. It is useful to distinguish between ownership of data in the operational environment and stewardship in the data warehouse. It is desirable to record patterns of access to the warehouse in order to optimize and tune performance. Less frequently used data can be migrated to cheaper storage media, and various methods can be used to accelerate access to the data that is most in demand. Most databases do a good job of hiding such physical details, but specialized performance analysis tools are usually available. Some general-purpose tools, such as Information Builders’ Site Analyzer, also are available. Reference data is stored in an external table (see discussion on Star Schema) and contains commonly used translations of encoded values. The contents of these tables must be stored in order to guarantee the ability to recover the original unencoded data, together with effective from and effective to dates. Building a data warehouse without first constructing a data model is very difficult and frustrating. When a data model is used, metadata describing the mapping between the data model and the physical design should be stored. This allows all ambiguities or uncertainties to be resolved. From the point of view of the Query Manager of the data warehouse, the Metadata Repository can be perceived to have three logical layers: the Information Navigator, the Business Metadata, and the Technical Metadata. Figure-1 above illustrates this concept. The query manager accesses the metadata through the Information Navigator layer which is the topmost layer of the metadata repository. The higher layers, in turn, access more detailed metadata components resident in the lower layers whenever required.